Summary: Nick and Meg, a British couple celebrate their thirtieth wedding anniversary with a weekend getaway in Paris. As they travel around the city, they revisit the highs and lows of their relationship, fight about their faults, and continue to run out of restaurants without paying the bill. They meet up with an old colleague of Nick’s and attend a dinner party at his house, leading to some painful truths being spoken aloud. At a quick glance Le Week-End could easily be written off as a film that is meant for the older set, but director Roger Michell (most noted for Notting Hill) instead makes this a film with a really strong message for anyone fascinated with love. 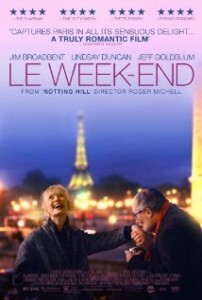 Written by Hanif Kureishi Le Week-End sees an aging couple, made up of the seemingly lost teacher Meg (Lindsay Duncan) and the all-at-sea Nick (Jim Broadbent). Nick has decided to take Meg to Paris for a weekend where he hopes their marriage of thirty years can have some new life pumped into it, and during which time he can pluck up the courage to tell her that he has been recently fired from his job as an university lecturer for making an inappropriate comment to a student. Their time in France however isn’t exactly what Nick had in mind. First Meg is not happy with where they are staying and then it becomes painfully obvious that Jim can’t do or say anything right in Meg’s eyes. Just to top it off they couple soon find themselves experiencing money problems and just as some home truths are being laid down on the line they run into Nick’s old friend Morgan (Jeff Goldblum). As a film Le Week-End seems to be all over the place… but in a good way. It seems that Roger Michell has the uncanny ability to mash his genres so well the audience never really knows what is coming next. The film reaches high tensions of drama as accusations of adultery are flung around, while at other times the film hits the comedy spots as a nervous Meg tries to run out on a restaurant bill that she can’t afford. Likewise this is a film that at times will make its audience feel uncomfortable. The Meg/Nick relationship often leaves the audience feeling claustrophobic and ill at ease as you are trapped watching a car crash getting worse right in front of you. Then there are the other times of uncomfortableness as frank scenes of a sexual nature play out in front of you, including one where Meg has Nick on all fours acting like a dog who is desperate for just one sniff of her… privates. The film’s up and down nature is also on show by the fact that the audience is often left drowning in moments of emotional suspense but then left out to dry by an over long dinner party towards the film’s finale. What brings even more emotion to Le Week-End are the strong performances by the key cast. Lindsay Duncan portrays the fragile and cold Meg with complete ease while Jim Broadbent again puts on an acting master class as he portrays Nick as a conflicted yet interesting character that the audience can’t help but feel for. Then there is Jeff Goldblum who isn’t called upon to do much but does deliver a smarmy presence when he really needs to. Le Week-End does throw up some challenges for its audience but it is well worth a look if you like a good emotionally fuelled drama. Other Subculture Media Reviews of ‘Le-Weekend′: Nil.